Time doesn’t go by when I don’t hear about someone going on a juicing cleanse to restart their body or lose weight. I went on one several years ago and had great results, but they were predictable since I only consumed juice for three days. My first cleanse was difficult but after I survived/finished, I didn’t completely write off juicing and would consider doing it again. So when Nekter Juice Bar in La Jolla opened up a few months ago, I had to check them out and see if I felt the same way about juice cleanse. 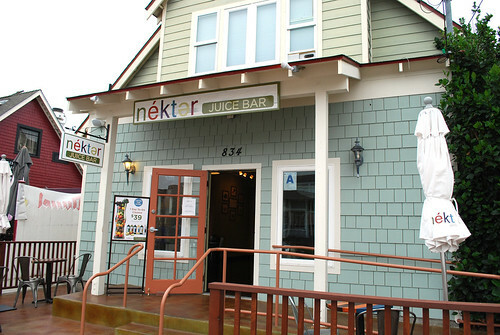 Nekter Juice Bar is company based out of Costa Mesa with other locations around Southern California. La Jolla is one of their newest locations and can be found on Kline Street. 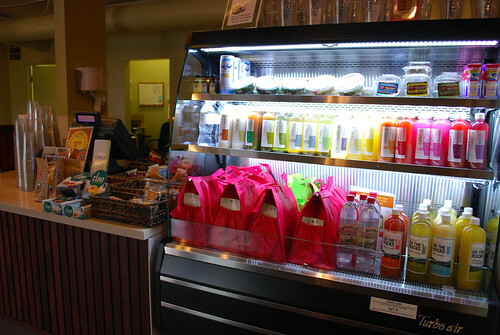 They offer a la carte juices (prepacked to go or made on the spot as you wait) as well as smoothies and acai bowls. But for those (like me) wanting to do cleanse for several days, they have packages ready to go. One thing to do in preparation for a cleanse is to give up coffee a few days in advance. Other than water, nothing else but the provided juice is allowed. (Emergency almonds and lettuce wrapped around a slice of avocado are allowed if you must have something solid.) Lucky for me, I had already been caffeine free for a few weeks so I had no adjusting to do. I had also been watching what I was eating the day before and not indulging in anything too rich or heavy. Aside from food, I also had to plan around my calendar and make sure that there wasn’t any event or gathering centered around food. I wanted all temptation removed, aside from what Paul was eating, to be out of sight. The juice in bottle two was pineapple, cucumber and coconut water. It was delicious. I loved the addition of coconut water and wrote down the ingredients in case I wanted to replicate myself. Somewhere between the second and third juice I lost time and found myself trying to catch up at 1:30. There are six juices to drink every day and I had four more to go. The third juice was a blend of celery, parsley, kale, spinach, apple, cabbage and lemon. This was my least favorite juice by far. I was starting to feel bloated, tired and my mind was unfocused. My stomach also was making gurgling sounds. To compensate for how I felt, I took a long nap. By the time I woke up at 4 p.m., my body was ready for the fourth juice bottle which was lemon, agave nectar and cayenne pepper. This spicy lemonade was just the kick I needed for finish out my afternoon. I missed having an afternoon snack so I lingered drinking this juice. Dinner time rolled around at 6 p.m. and I requested that Paul forage around the refrigerator for his dinner. I couldn’t torture myself being around solid food. Bottle number five (apple, cucumber, parsley, spinach, lemon and ginger) didn’t compare with the smell from short rib ragu leftovers he found in the freezer. The only thing that made it better was knowing I had the “dessert drink” waiting for me. The last bottle was creamy and rich. It was cashews, agave necter and vanilla bean. After drinking watery juices all day this one coated my stomach and filling it up that I didn’t go to bed hungry. I still had the urge to chew but this last drink helped me with its thick texture. It was like a nutty milkshake and I looked forward to this drink every day. The following two days were a blur. I kept my activities to a minimum and didn’t venture too far from the house. (Being near a restroom was of utmost importance since my bladder seemed to always be full.) I was also constantly cold. The instructions recommended also drinking lots of water to help with the cleanse. After drinking so much liquid throughout the day, I took sips in between juices to clear my palate but avoided full glasses. I wasn’t dehydrated at all. At the end of three days, it was humbling to see all the empty bottles lined up after I finished. I survived! According to the nutritional content, the juices ranged between 80 to 180 calories with the exception of the cashew drink which was a hefty 340. (Total caloric intake each day was 1010— about 200 calories less than I try to consume.) I didn’t weigh myself before or after. In my previous juice-cleanse experience, I lost about 5 pounds. This time I made it a point to focus on how I felt rather than how much I lost. Due to the cleanse, I lost my craving for processed food and craved a lot of fresh fruit. My clothes were a bit looser. In addition, it took less food to fill me up and I slept extremely well. I have a juicer at home but the nice thing about this program was having the juices numbered and prepared for you. The last thing I would want is to think about making the next juice as my stomach was grumbling. 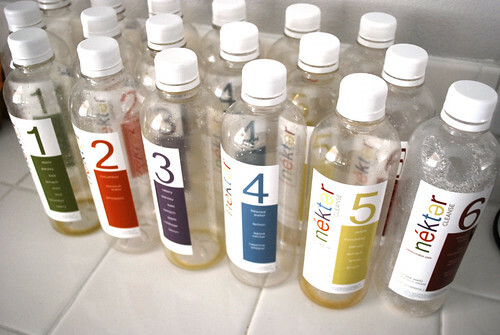 Nekter Juice cleanses can last a little as one day and as long as five. But realistically, if you’re going to be juicing, doing it one day isn’t enough but five days would be torture. I wouldn’t mind doing a cleanse again. 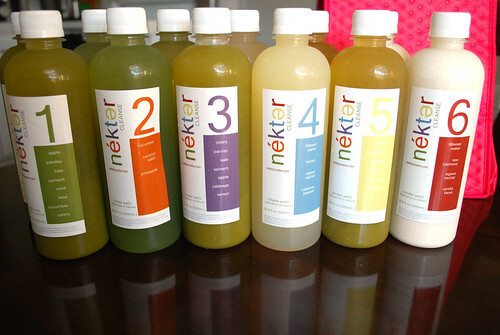 Juice cleanses at Nekter are currently on sale for $195 (regular price $225). A single day cleanse is $39 for a limited time. Regular and organic formulas are available, as well as a Master Cleanse for those wanting something more extreme. (It appears one of the difference between a regular cleanse and master is that one drink a beet-based.) There are other comparable juices on the market; I recommend checking out all the juices before you start and see which flavors appeal to you. I live and work in the area, and I am considering this cleanse- thanks for the post! I just ordered the 3-day and enjoyed reading about your experience… I’m nervous since I am a coffee addict but plan on preparing a few days ahead of starting my cleanse. I just purchased my first 3 day Nekter cleanse today. Thanks for your post. The first drink was rough for me. I felt like I was drinking bitter grass, but I am on the cleanse because I have a habit of eating junk food and fried foods so I assume my taste buds are to blame for that. Hopefully I can be as successful in holding off solid food for 3 days as you were. Looks like you’re on day 2. Hope it’s going easier for you. Today’s my first day on the three day cleanse. I’m concerned the coconut charcoal drink is a bit much to get down. What is the importance of this drink? 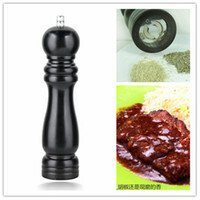 Charcoal supposedly acts to draw out impurities. I know in the past, beets have been used.